"After waiting so long, it feels good to do more than two moves!" 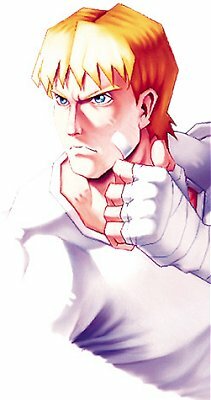 Born in Metro City, Cody gained a reputation as a feared street fighter. He often competed in local tournaments to prove his skill, and during one of these fights he met Guy. The two became friends immediately, despite their different backgrounds and fighting styles. Cody also became friends with Metro City mayor and former wrestler Mike Haggar, and fell in love with Haggar's daughter Jessica. The two became inseperable, and Haggar felt it was only a matter of time before the two would marry. Tragedy struck the young couple one day when Jessica was kidnapped by the criminal Mad Gear Gang. Her father had passed legislation to begin a war on organized crime, and the Mad Gear kidnapped Jessica to stop Haggar's efforts. When Haggar recieved word of this, he quickly enlisted Cody and Guy's help. The trio began an assault on all Mad Gear strongholds, and it was not long before the organization was ruined and Jessica was saved. Haggar thanked Cody and Guy personally, and it seemed that everything in Cody's life was right again. After the destruction of the Mad Gear, the three went their seperate ways. As time passed, Cody found himself fighting more often, sometimes for no reason. He became despondant, and began to drift around, searching for peace. Jessica noticed the change in him and left, only serving to increase Cody's combative tendancies. He continued to wander until one day he was arrested for severely beating an opponent during one of his numerous fights. Cody was imprisoned in the Metro City jail in utter disgrace. He remained there for some time, until an opportunity arose and he escaped from prison. On the run from the authorities, he met up with his old friend Guy. Having heard of Cody's plight, Guy was quick to lend a sympathitic ear to the fallen hero. The two dueled to recall old times, and Guy's kind words set many of Cody's inner demons to rest. Refreshed, Cody decided to leave the city and lay low for awhile, as there were many policemen and crminals alike who were searching for him. Bidding Guy farewell, Cody left for parts unknown, in search of a new destiny.